Sue-Ellen Kirby shares her review of Wealth Within since completing the Diploma and the Advanced Course. According to Sue-Ellen, by actively trading I have control over my life and finances, and I don't have to pay fund managers exorbitant fees for a buy and hold approach. 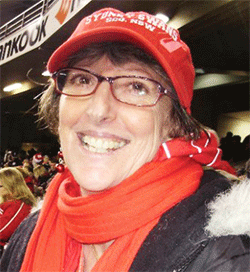 Sue-Ellen was born in Grafton, northern NSW and grew up in Sydney’s western suburbs. She is now living in country Victoria. She enjoys babysitting her two-year-old grandson and also works part time for an accounting firm. Sue’s interests include, but are no way limited to gardening, self-development, improving her mindset, meditation, spending time with friends and family. She is also rather passionate about conservation and the environment. Work status: I currently work part time and trade on the side. However, I have every intention to eventually trade full time. Occupation: Administration at an accounting firm on St Kilda Rd, Melbourne. Number of years trading: About 5 years. You can't call what I did before that ‘trading’. It was more like 'de-investing' if there is such a word because unlike now, I had no idea what to do back then. Anything else you would like to add to your background? : I was a stay at home mum for most of my life. I had no income, no money and like many women of my generation, no super worth mentioning. After losing my Dad and my older daughter who had spinal surgery that did not go as well as hoped, I went into a deep depression. I was not working at the time nor was I even capable of working, and then to further compound things my second marriage ended because of my depression. These events happened at around the same time late in 2004 to early 2005. I had fallen deep into a hole and couldn't see any way out. Then one day something switched on for me and I started climbing out of that hole. I began looking for ways to support myself and get back control of my life. I did not want to be a victim anymore, and I realised that it was up to me to take responsibility for myself and my circumstances. It was not easy to make the changes needed, but I didn’t expect it to be so either. After my Dad died in 2004, I inherited some shares; I did not know what to do with them so I just let them sit and lose value. Although at the time, I didn't know that they were losing value. It wasn't until after the Global Financial Crisis, in around 2009, that I thought there had to be a better way to manage my portfolio and I started becoming interested in the markets and broadening my knowledge. I attended a lot of seminars that made trading sound so easy, way too easy in fact, and what they talked about just didn't feel right for me. I’m happy to say that I did not invest in any of these so-called ‘educators’. At the same time, I also started watching Sky Business Channel, but most of the time I had no idea what they were talking about and couldn’t really make sense of what I had to do to make my share portfolio work for me. Then one day, while browsing the internet, I saw a link to an e-book from Wealth Within. It just felt right. So, I took the plunge and I clicked on the link. As I clicked on that link, little did I know that I was closing a page in my life and starting not just a new chapter but also a whole new book- one where I began to feel like I was in control of where my life was heading. A couple of months after reading the above-mentioned e-book, I spoke with one of the education consultants at Wealth Within. I needed time to get myself into the right frame of mind for study as it had been 30 years since I had done anything like this; I started the Diploma of Share Trading and Investment and finished that in 2012. I waited over 12 months before I started the Advanced Trading Strategies Course and completed it in August 2014. The Advanced Diploma added another level to what the Diploma had taught me but I never forget the basics of the Diploma, that being the foundation of trading. It was online which made it very easy. I also attended workshops from time to time. Did I ever ! I started buying stocks before I knew what I was doing. It is so easy to buy, but the problem was I did not know when or how to get out. I took shortcuts, did not use a trading plan, and tried to wing it. Some trades paid off, but as you can imagine, most didn't. How does that saying go, 'experience is the best teacher'. Unfortunately, from experience I know that it can be costly when you don't know what you’re doing, or follow rules. I am a bit of both. Mechanical trading is great as it keeps your emotions out of the picture; you just do what your plan and rules say to do which is what I now know is needed early in trading. As I have gained experience, I not only use the 'science of trading' but also have experimented with the 'art of trading', which can give you so much more flexibility and success. Who have been some of your mentors and role models? What impact have these people made on you personally as well as on your trading style? The team from Wealth Within: Dale Gillham, Janine Cox, Kay and Jennie believed that I could achieve my goals and do the work necessary even when I didn't, and that helped me keep going when I got stuck or had a meltdown. Dale and Janine have influenced my trading style and I have taken a bit from each of them, making me the trader that I am today and will be in the future. 'Keep It Simple' would be my style. I do a bottom up analysis. It does not matter to me which sector a stock comes from as long as it is going in the right direction. I look at the chart to see what the stock is doing and where it is in the bigger picture. Here I use techniques such as Dow's Theory of the Market. My training taught me many things some of which were to follow systematically a process to mark on the monthly chart natural support and resistance, the all-time high price, the all-time range, the last major range, and other price analysis. Other tools and analysis I use are trend lines, patterns and Elliott wave etc. Then I look over the chart to see which strategy I believe will work well and mark entry and exits for the different strategies in different colours to confirm the strategy that works best for me. I then do my back testing on each strategy separately until I get the result I want and am comfortable with. I do this on both monthly and weekly charts. If I am looking at the long-term, I check the fundamentals of the stock to see if it fits my criteria. Whereas for medium-term, I do more analysis on the weekly chart, although I might enter a medium-term trade on the monthly chart. I then sit back and wait for a trigger using Pattern Breakouts, Dow Theory, Trend lines or a combination of those rules, whichever suits the stock according to my back testing. I know I said I like to keep things simple and whilst what I have just talked about may seem complex, it is indeed quite simple, fun to do and not very time consuming. I would say my first trade MCE had a big impact on me. This was the point when I learnt that I did not have a clue and really needed to get educated. After doing the Diploma of Share Trading and Investment, I took a position in SYD. It was a good trade. I followed my rules and it was profitable. Most importantly for me, it built my confidence and gave me a sense of achievement. It gave me that feeling that now I know I can do this. My worst trade was MCE. I was up 75% but did not know when to get out, as I had not learnt to trade yet. Even if I had exited with Dow Theory on a weekly chart, I would have been up around 29%. I did not know about Dow Theory at the time and I hung on in hope as it fell away and ended up with a loss. Luckily, it was a small position and wasn’t as bad as it could have been. My best trade so far is BSL. By following my rules and using the 'Art of Trading' I have made three very successful trades. I am a medium to long-term trader but mainly medium-term. However, now that I have more confidence, I want to get into shorter term trades for cash flow. I know I need to change how I think for that, as I seem to be more hardwired for medium to long-term. I feel you need to start with longer term trades to really learn the rules, get experience, build your confidence and work on your psychology. Now that I have done the work in all of these areas, I know that I am ready to move on to short-term trading. The key is to make sure you set aside the required time to look after your trades. I mainly trade the ASX top 100 as they are more liquid. As I gain more experience, I may venture into some of the small caps out to the ASX 200- but at this stage I am happy with the stocks in those indexes. I am educated whereas many traders I meet are not. I know that I can work out how a stock is going to unfold so that I can make confident decisions to trade or not trade accordingly. I like easy, simple and boring. Not set and forget, but something I do not have to check on every minute of the day as I have better things to do with my time. What I always have in the back of my mind is that nothing in trading is going to work 100% of the time, so I need to have an exit strategy in case the trade goes the wrong way or not according to my plan. Pattern breakouts are my favourite. I can see them as soon as I open a chart, I can see them everywhere and if you use Gann's 50% rule, they can really pack a punch and get you in and out with a high probability of success most of the time. The key with these patterns is first being able to properly identify them and secondly, in having a good strategy to enter and exit. I have found this requires the right training and good feedback, matched with actually getting the experience of trading with them. I want to live life on my terms, my own rules and being in control of where I am going. Share trading gives me that. By actively trading I have control over where my life and finances are heading and I don't have to pay fund managers their exorbitant fees for a buy and hold approach, which now doesn’t make sense to me at all. I also get a lot of enjoyment from trading, even the back testing and analysis. I think that makes me a 'nerd', but a happy 'nerd'. My lifestyle has not been affected yet, but I have been able to increase my trading capital and position sizes by putting any income earned from share trading plus dividends into an account only for share trading and education. When my capital grows and I am creating cash flow from shorter term trading over a few weeks to about three months, I will then notice the difference in my lifestyle and be able to relax and enjoy my life more without worrying about the next gas bill. My ambitions from trading are simple, but important for the lifestyle I see ahead for myself. Based on my own experience, the Diploma of Share Trading and Investment and the Advanced Course from Wealth Within are a must if you want to succeed in share trading. Wealth Within teaches you strategies and tools to use to be a successful trader and the support you receive from the staff is fantastic; they are with you every step of the way. I have printed all the modules and have them in folders in my office bookshelf for easy reference. Additionally, there is also the Art of Trading workshop which is held every year for students, both past and present, where we work on anything from trading strategies to our psychology. I always learn something new, it’s also a great place to catch up with our mentors and fellow students who have become friends. I shall keep learning and become the best trader I can be, so I have a life free from financial struggle and stress. I don't want to be a burden on my kids or the government. I am confident I will be able to give up work completely so I can spend more time doing the things I love, like spending time with my family, playing with my dog Poppy and taking her for walks, and looking after my garden. Having the chance to volunteer in my local community and being able to give back also interests me. It’s great knowing that I will not have to pinch pennies and I can give larger amounts of money to my favourite charities and causes.